This chipotle ranch chicken salad is smoky, fresh, and delicious. The perfect summer salad! The BBQ’d chicken pairs perfectly with the smokiness of the dressing. Yes, I love this dressing and have used it in various recipes 🙂 It’s definitely repeatable. Over and over. Another recipe using this dressing maaaay be rearing its head shortly. If you don’t like the dressing, I apologize in advance. 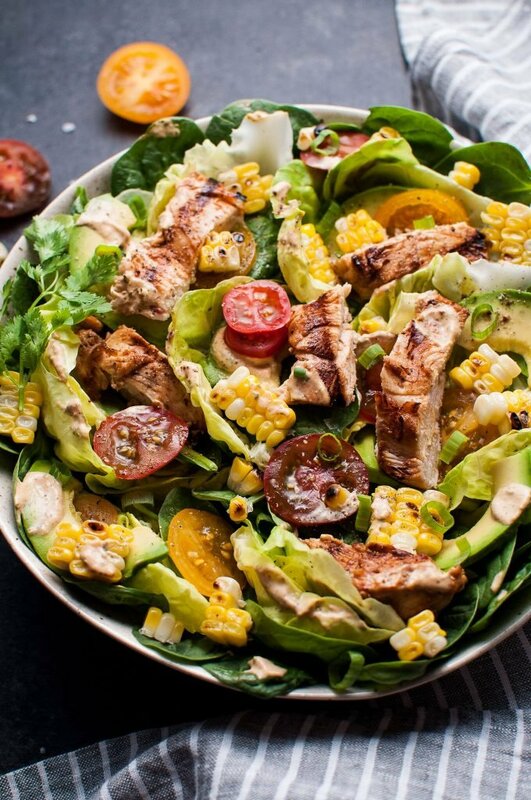 Grilled corn is just awesome and adds an extra little something special to this salad. Little tomatoes, avocado, and scallions add even more color and flavor. I never know what to do with the rest of the chipotle chilis in adobo sauce once I’ve used some of it for the dressing. It’s the tiniest little can, but it really seems like it contains a lot. I decided to put some in the marinade (genius, right? :P). Anyway, it doesn’t make the chicken too spicy or anything. If you do want your chicken to be spicier, add more than the 2 tablespoons in. The rest of the chipotle chilis are sitting in my fridge as I type this. I’m really hoping my spice-loving husband is going to finish them soon! I really don’t have anything else to say about this recipe. How much can you really say about salad? All you really need to know is that it’s fresh, easy to make, and full of flavor – everything a summer salad should be! Let me know if you’ve made this chipotle ranch chicken salad! A tasty grilled chicken salad with an amazing chipotle cilantro lime ranch dressing! Prepare chicken by slicing the chicken breasts lengthwise (I butterfly then cut in half) so you have four thinner cutlets. Add chicken and marinade ingredients to a large ZipLoc bag and mix it all together. Place in fridge for at least 30 minutes, up to two hours. Meanwhile, make the dressing (see recipe here). Refrigerate it until it's needed. While grill is heating up, prepare the other salad ingredients and place in a large bowl. Grill corn for a few minutes on each side (for about 10-12 minutes total). Using a knife, cut the corn off the cob once it's cooled down a bit. Grill the chicken for approximately 5 minutes per side, or until it's cooked through. You may grill the corn and the chicken at the same time if you're using a BBQ and have enough room. 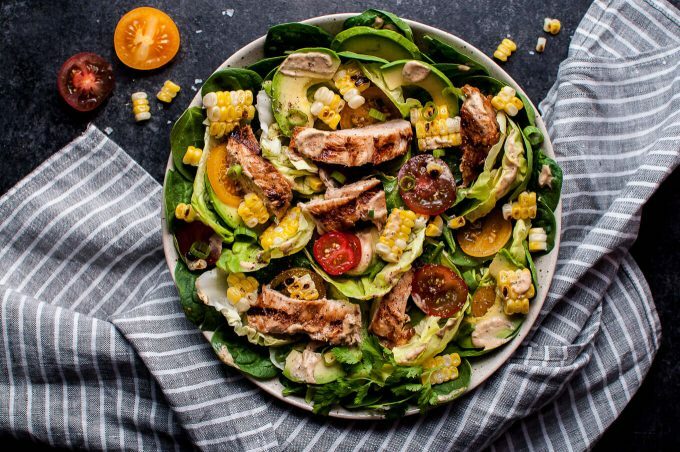 Once chicken is cooked, you can either slice all the pieces into strips and mix it in with the dressing, or simply place each chicken piece on top of each person's salad. Serve immediately. I used a gas BBQ to make this recipe. Keep in mind that these directions are only a guideline as every BBQ or grill is different so adjust cooking time accordingly. This sounds fantastic! Just reading it made me want to go make it RIGHT NOW! Yumm yumm! I am actually working on a round-up for salads/dressings right now and would love to add this one in! I would link back with a photo, and think my readers would love it! This looks so scrumptious! Absolutely wonderful ???????? 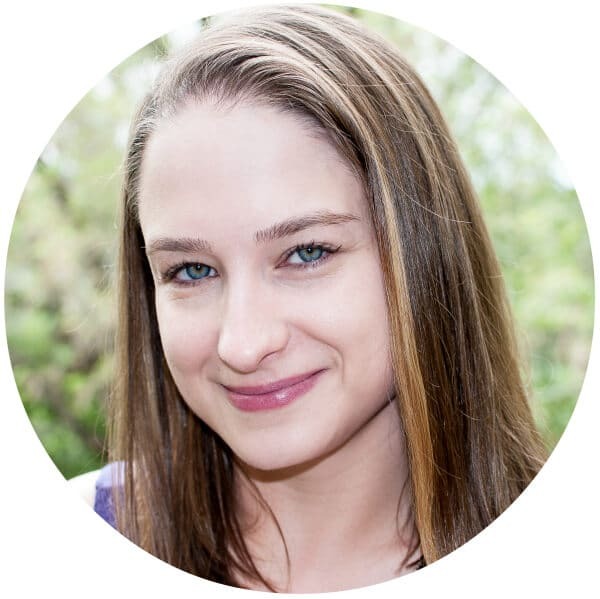 Will definitely start following you and your recipes! Looks so yummy! This salad looks amazing! It’s so vibrant and fresh. Perfect for Summer! Anything with cilantro gets my attention quick! Sounds super yummy! Thanks Paula!! It’s one of my favorites too.